Mid-level cushioned sock - thinner than the CoolMax style but thicker than the power style. It’s easy to forget that socks are an essential and vital part of comfort and your workout. Our Radical designs and colors keeps you stylish - on the road - at the gym - or recovering at home. Mojo Recovery Compression Socks utilizes multiple zones to provide extra cushioning + moisture wicking and are specifically engineered, not only for high performance, but also for the respective feet they go on. These Socks are specifically engineered to match the specific contours of each foot. Selective cushioning allows for padding and compression to be strategically placed in key areas, providing essential shock absorption. Better fitting socks can cut down on blisters and other irritations caused when your foot slides around within your sneaker. Used by professional triathletes around the world, Mojo Graduated Compression socks are scientifically proven - to maximize power, boost energy, and speed recovery time. More energy, an improved metabolization of lactic acid, and faster recovery so you can return to training quicker than ever. Founded and based in Brooklyn, New York - our philosophy is to create products which will advance Sport Performance & Recovery. Mojo design & materials are developed by Mo Blinder who has been developing, manufacturing and distributing in the medical compression industry for 15+ years. Mo is a weekend Cyclist and a daily Swimmer who wanted to create cutting edge Performance and Recovery garments with funky, sport driven designs, materials and patterns. Working closely with professional athletes and designers Mo has tailored the Mojo sock into something that you will want to wear. I was very disappointed that these were SO tight. They really should be sized by calf measurement. There is no give to them at all making them extremely difficult to get on; and I could only get them to partially cover my calf. I would not order these particular stockings again. This sock is working very well for my situation. I have been approved for vein stripping because my varicose condition is so advanced, I also have a chronic ulcer so I need the compression. Only short time wearing these, I am seeing healing in the ulcer. Feel great on all day, I work on my feet 12+ hours, I am surprised that my legs feel so nice and cool, NO sweating. I LOVE that the toe area is not constricting, this can be very uncomfortable with sheer, prescription hose that I've had. 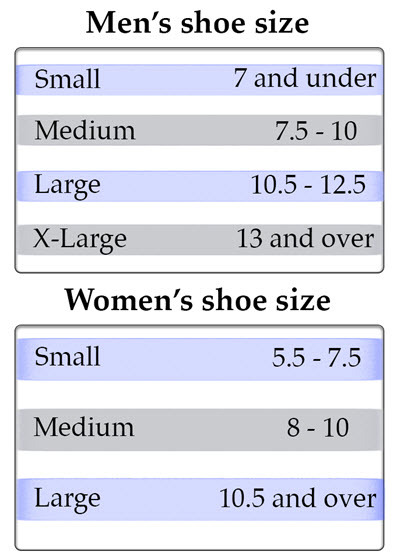 I wear size 8Wide shoe and bought the medium and very happy with the foot room! Pretty easy to get on, also. I also have the footless thigh high recovery pair and the compression is similar which is great. I will be trying other options in Mojo socks because I am super-pleased so far. Love this product.> Provided great support when i weight trained. I did not experience any cramping or fatigue. Looking forward to purchase more. After having my varicose veins removed and wearing compression hose for 3+ weeks my doctor recommended the below the knee compression socks. I just took a blind stab at these and love them. The toe bed has plenty of room and they are very comfy. I will buy more! I ordered these socks but they o not fit.